Attorney Mehta focuses on getting the best results for her clients. In the case of Commonwealth v. T.C., she successfully moved for the suppression of 13 grams of crack cocaine. Attorney Mehta also beat the accompanying DUI charge. In this case, the government alleged Attorney Mehta's client was driving while intoxicated. The arresting police officer claimed that he pulled T.C. over because the head lights of T.C. 's vehicle were not on at night. But Attorney Mehta knew better. She recognized that this was a late-model car, and she quickly obtained proof that the car's headlights actually turn on automatically at night. Through skillful cross-examination, she was able to demonstrate this key fact to the trial judge during the motion to suppress. This led to not only the eventual suppression of the large quantity of drugs in the car but also all observations of her client, meaning the government could not proceed on the DUI charges, either. With the motion to suppress granted, prosecutors were forced to withdraw all charges. T.C. now faces no criminal record from this arrest! G.R., the assistant manager of a local market, was charged with Simple Assault in Philadelphia for allegedly getting into a fight with a co-worker at work. Prosecutors alleged that G.R. punched a co-worker in the throat, fracturing his larynx, after the co-worker engaged in a verbal altercation with G.R. relating to work responsibilities. Although a broken bone can often lead to Aggravated Assault charges, prosecutors moved only to prosecute G.R. in the Philadelphia Municipal Court on the Simple Assault charge. Despite the fact that G.R. was charged only with misdemeanors, the stakes were high for G.R. because G.R. stood to lose his job in the event of a conviction relating to an assault of someone at work. Attorney Goldstein defended G.R. and obtained a full acquittal in a trial before the Municipal Court Judge. Attorney Goldstein established that G.R. acted in self-defense by cross-examining the complainant on the size difference between the two men, the discrepancies, contradictions, and omissions in the complainant’s statement, and the complainant’s lack of medical records to show that he had actually sustained the injuries that he claimed. Attorney Goldstein established that the complainant, a much bigger man, got in G.R.’s face, pushed him repeatedly, and made a movement consistent with lining up to throw a punch before G.R. ever responded with force. A background check of the complainant also revealed that he had prior convictions for conspiracy to commit homicide as a juvenile and simple assault as an adult. Mr. Goldstein successfully moved for the admission of those convictions into evidence in order to show that the complainant was actually the initial aggressor. Mr. Goldstein then called G.R. to the stand to testify that he had acted in self-defense and believed that the complainant was about to throw a punch. The judge rejected the complainant’s inconsistent testimony and promptly acquitted G.R. on self-defense grounds. Our criminal defense lawyers recently won a motion to suppress of physical evidence in a case involving drug charges and gun charges in the Philadelphia Municipal Court. J.L. was pulled over by police one night as the passenger in a vehicle. Police claimed that the vehicle smelled like marijuana and that J.L. made furtive movements as they approached the car. Police also claimed that J.L. seemed very nervous and lacked identification when the police spoke with him. Police decided to remove him from the car and frisk him based on these observations. The officer claimed to feel a pill bottle. Believing that the pill bottle would likely contain contraband, the officer then went into J.L.’s pockets, removed the pill bottle, and found crack cocaine in the bottle. The officer also claimed that J.L. had a large amount of cash in his pocket. Officers then searched the rest of the car and found more drugs and a gun in the trunk. Prosecutors initially charged J.L. and the driver of the car with possession both of the drugs allegedly found in J.L. 's pocket as well as the larger quantity of drugs and guns in the trunk. Prosecutors listed the case for a preliminary hearing on the felony charges, and J.L. retained the criminal defense attorneys of Goldstein Mehta LLC for the preliminary hearing. Our attorneys were able to convince the prosecutor that they could not prove that J.L. constructively possessed the items in the trunk, including the larger quantity of drugs and the gun, because J.L. did not own the car and had never been seen accessing the trunk. Prosecutors agreed, withdrew the felony charges, and remanded the case to the Philadelphia Municipal Court only on the charges of possessing the crack cocaine in the pill bottle. When the case was listed for trial, Attorney Goldstein moved to suppress the crack cocaine. In general, when police pull a car over in Pennsylvania, they may remove a passenger from the vehicle without any level of reasonable suspicion. However, in order to conduct a Terry frisk of the occupant of a car, the police must have reasonable suspicion both that the suspect is engaged in criminal activity and that the suspect is likely to be armed and dangerous. This means that police must be able to provide an articulable belief, consisting of real reasons, for why the officer believed that criminal activity was afoot and that the defendant was likely to have a weapon. Here, the officer testified that he believed the defendant was likely concealing weapons or contraband in the car due to his furtive movements, nervousness, lack of identification, and the odor of marijuana in the car. He therefore decided to conduct a frisk. The officer failed to realize, however, that a Terry frisk is limited only to a cursory pat down for weapons. When an officer feels something that is plainly contraband during a frisk, the officer may then conduct a full search and remove the object for further inspection even when the officer does not believe the object is a weapon. But the officer must be immediately able to tell that the item in question is contraband. The officer cannot conduct a full search of a defendant’s pockets and the containers therein solely because the officer feels some kind of object and doesn’t know what it is or may contain. After the officer testified that he could immediately tell that the item in question was a pill bottle, Attorney Goldstein provided the Court with Pennsylvania Supreme Court case law in which the Court held that a pill bottle cannot automatically be considered contraband. In most cases, it is perfectly legal to possess a pill bottle, and most pill bottles are not used to transport contraband. Accordingly, it is not immediately apparent that a pill bottle contains contraband. Based on this Supreme Court case, Attorney Goldstein successfully argued that the officer exceeded the scope of a lawful Terry frisk and that the pills should be suppressed. The judge agreed and granted the motion. The Commonwealth elected not to appeal and withdrew the charges. W.D. was charged with selling a significant amount of marijuana from a car. Philadelphia Police conducted a narcotics surveillance targeting a block known for high drug activity. During the course of that surveillance, they were able to successfully have a confidential informant purchase drugs in a house on that block. Based on those controlled buys, police obtained a search warrant for the house and returned to execute the warrant. While they were preparing to execute the warrant, police allegedly observed W.D. selling marijuana to dozens of buyers from a car parked up the block. When police went to execute the search warrant, they also searched W.D. and the car in which he was sitting and found a quantity of marijuana and a large amount of money. Accordingly, police charged W.D. with Possession with the Intent to Deliver. Fortunately, W.D. had no prior criminal record and was enrolled in college. Our defense attorneys worked with W.D. to put together a strong application for ARD on his behalf. We obtained proof of employment, college enrollment, and character letters from family members and friends. Using this mitigation packet, we were able to convince prosecutors to offer entry into the ARD program for the felony Possession with the Intent to Deliver charges. Prosecutors almost never offer ARD for PWID, but in this case, W.D. will have to complete a short period of probation, community service, and pay a small fine. Once those requirements have been completed, the charges will be dismissed and W.D. can have the entire case expunged with no admission or finding of guilt. Attorney Goldstein successfully obtained a full acquittal in a juvenile delinquency Robbery case. In this case, J.G. was charged with strong-arm robbery and related theft charges for allegedly trying to steal the complainant’s cell phone. Prosecutors claimed that J.G. and a group of other juveniles had surrounded the complainant, held him down, and gone into his pockets, taking cash and trying to take a cell phone. J.G. insisted on his innocence and our defense lawyers took the case to trial in Philadelphia Family Court. By cross-examining the arresting officer on the inconsistencies between the description of the robbers given by the complainant and the clothing that J.G. was actually wearing when arrested, and pointing out that J.G. had neither the complainant’s cell phone or money when arrested, Attorney Goldstein successfully convinced the Family Court judge that police had arrested the wrong person. Accordingly, the judge found J.G. Not Guilty of Robbery and all other charges. J.G. will continue to have no criminal record and may have all of the charges expunged. FACING CRIMINAL CHARGES OR CONSIDERING AN APPEAL? WE CAN HELP. If you are facing criminal charges or deciding whether to appeal a conviction or sentencing, we can help. We have successfully defended thousands of clients in jurisdictions throughout Pennsylvania and New Jersey. We can also provide advice on the merits of pursuing an appeal or post-conviction relief act petition. 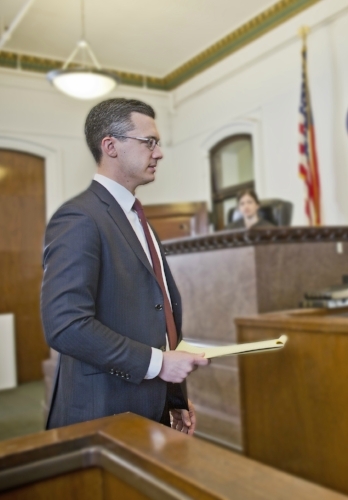 We offer a free 15-minute criminal defense strategy session to each potential client. Call 267-225-2545 to speak with an experienced and understanding criminal defense attorney today.